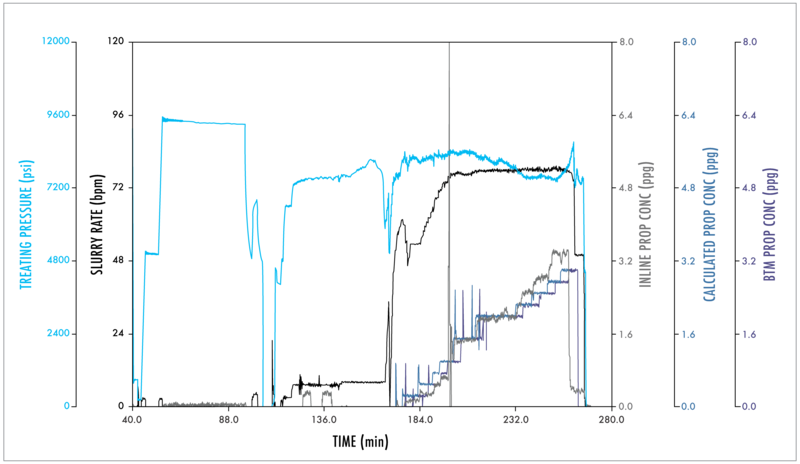 This graph depicts the wellbore pressure test and succesful frac of stage 1. It demonstrates the benefits and effectiveness of the FlowGun™. Pressure started on the low end, at 5,000 psi, and was steadily increased. Walk-arounds were performed to ensure there were no leaks in the well or surface iron. When given the all-clear, pressure was steadily increased to the maximum level of 9,500 psi, indicated by the large plateau on the graph. All in all, in situations like this, a complete pressure test is conducted to ensure the inserted casing can withstand the frac and that pressure is holding. The FlowGun is fired and pressure drops rapidly. Once pressure falls, acid is displaced, rate is increased and sand is placed at desired rate. FlowGun gives the biggest advantage, offering the highest injectivity rates.